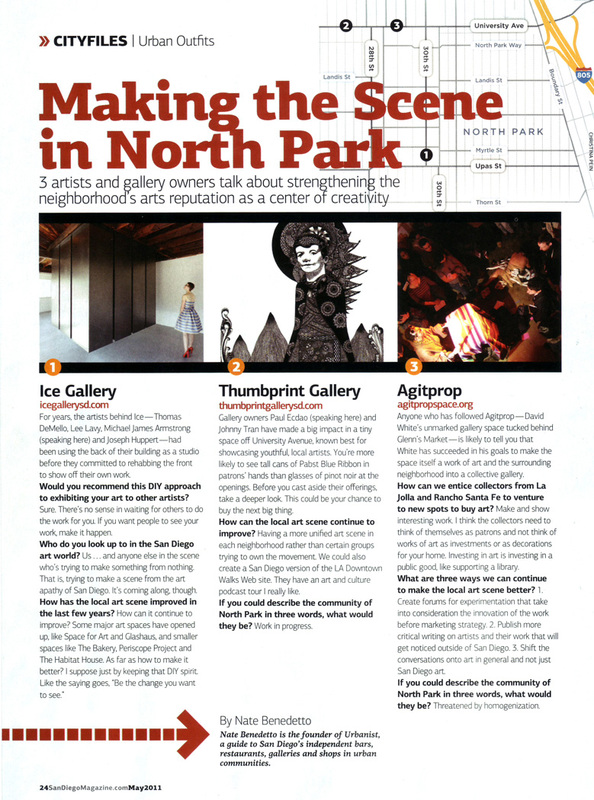 ICE Gallery, along with Thumbprint Gallery and Agitprop, is featured in the May 2011 issue of San Diego Magazine. Thanks to Nate Benedetto and Laurie Granger for including us. You can also view the article on the San Diego Magazine website. Why did you open a gallery / art space? Prior to our first show, the space had been in use as an artist studio. In fact two of us (Thomas and Lee) still use the back of the building as an art studio. That building has been used by artists for many years now, even before we were occupying it. Perry Vasquez used it as an art studio and an exhibition space a few years back. Although, no one that’s ever rented there has ever renovated it like we have. To answer the question, it’s simple, we had access to the space because two of us were already renting the building. It began by Thomas wanting to fix up the front space to have a place where he could view his own work outside of his studio, which is in the back. Once he did some very minor cleaning up in the front, he realized it might make a nice exhibition space and asked the other three of us if we would want to do a show. The first one to say they had an idea was Joseph. Shortly after he began work on his show, we all made a schedule for the rest of the shows. We were to all do a solo exhibition, one right after the other, and just for fun we’d start a website and promote each show. Just before Josephs show was to end we thought of shooting the documentary, and not long after that we started shooting. since then we’ve documented the entire process of making each show. Joseph and I have been friends for over 10 years. We moved to San Diego from Tempe, AZ in late 04. In 2005 Joseph began working at The Art Store (later became Blick) in Little Italy, and that’s where he met Thomas and then Lee. Sometime in late 2005 the four of us along with a few others started getting together every Sunday night to talk about art – we call it “art night”. In 2006 the 6 core art night members (the four of us included) had a group show together. We had 2 additional group shows with those 6 in the following years. The four of us have also worked together at the museum of contemporary art San Diego as preparators. We still have art night every Sunday night at cafe Bassam in Hillcrest. I’d say all of us have been artistic since we were kids, but I don’t think any of us started to get really serious about art until the early aughts. Were your shows last year your first solo shows? First for all but me. I had a solo show in August of 09 at Objct Gallery in Pomona. Has the experience of showing art in SD met your expectations thus far? I don’t think any of us have any specific expectations about showing art. I think the most we hope for is just that people come to see it. Which sometimes seems like an uphill battle. Would you recommend this DIY approach to exhibiting your art to other artists? Sure. There’s no sense in waiting for others to do the work for you. If you want people to see your work, make it happen. all of our shows, including our 3 previous group shows have all been completely accomplished and promoted solely by us. Have any opportunities come out of your solo shows? Projects or other shows outside of SD? How can we entice collectors from outside of the downtown area to adventure to new spots to buy art? Who do you look up to in the San Diego art world? Us…and anyone else in the scene that’s trying to make something from nothing. That is, trying to make a scene/market from the art apathy of San Diego. It’s coming along, though. If you could relocate your gallery to any city in the world, where would it be? How has the SD art scene improved in the last 5 years? What are 3 ways we can continue to make it better? It seems as though SD has had much of it’s current improvement just within the last 2/3 years. Some major art spaces have opened up, like Space For Art and Glashaus. and smaller spaces like The Bakery, Periscope Project, and The Habitat House. As far as how to make it better? I suppose just by keeping that DIY spirit. Like the saying goes, “be the change you want to see”. Do you make art / sell art full time? Make? Of course. Sell? No. As far as day jobs? Well, 2 of us are preparators, and the other 2 are an artists assistant. Do you aspire to make this a life-long, full-time career? If you could describe the community of North Park in 3 words, what would they be? We have no idea, i don’t think we really pay attention. One last note is that the article states that all four of the ICE boys share a studio at ICE. In fact it’s only Lee and Thomas that have a studio there. Reading back through the original answers Michael gave we see that the inaccuracy was due to the way he answered the question, and is not the fault of Nate Benedetto.